The photo I have used for this article shows a project of a dress that was donated to me from a family member who no longer needed it. It was an excellent design to make into an apron for a family friend of mine. 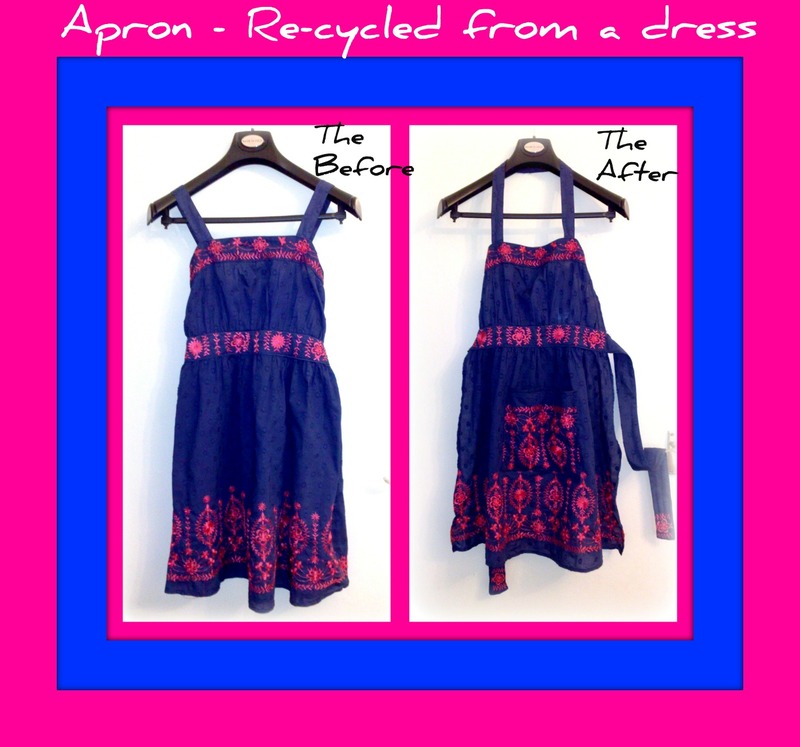 Aprons are my main project for upcycling clothes. The first time I made an apron from clothing was for myself. I had a lovely long flowing skirt, which got torn in the washing machine and was unrepairable. However there was still plenty material left on the skirt to be useful. I used the bottom front part of the skirt (this was the undamaged part) for the skirt part of the apron. I then made the apron front (chest square) from the same material. I then attached these together. The material at the back was long enough to make the straps for the apron too, so I didn’t need to have to use up my apron straps that I had purchased from the fabric shop. I also had enough to add a front pocket to the apron. For this project I didn’t need to use any other fabric, just the skirt! It wasn’t a particularly hard project, but it made me think that if I had a dress to make into an apron it would be a lot easier and quicker. Obviously the style of the dress makes a difference. So now I look at dresses that normally have a wide waistband and that have straps (not sleeves). Also if a dress already has long straps at the waist for tying in a bow at the back this saves making your own waist straps. I normally sew my own straps if I have enough matching material, however straps can be bought in many fabric shops by the metre. Step 1: Unpick the front of the dress from the back of the dress. Step 3: Re-attach the waist straps to the apron. Step 4: The neck straps of the dress were sewn together to make one strap to go over the neck. Step 5: Make a pocket from the material from the back of the dress and sew to the apron skirt. That was it, very easy, very quick and totally unique!